Do you want to escape the traditional workplace grind and become a Freelancer or Consultant in Dubai? For those imbued with an entrepreneurial spirit, it is difficult to imagine yourself on a somewhat rigid career path of paid employment, remaining in the one industry type or even the same country for your entire working like. Simply climbing the corporate ladder to senior management is not completely fulfilling, if you don’t have autonomy over your future. Freelancing and Consulting both offer a tantalizing balance between freedom and flexibility, responsibility and discipline. Do you know the difference between the two and what structure suits you best? While both freelance and independent consultants work for businesses on a project-by-project basis and generally hold no allegiance to any one company, there are significant differences between the two structures. An independent consultant is generally classed as an individual who either works for themselves with multiple clients or directly services a company that contracts out to multiple clients. A Consultant is often highly experienced in a particular field and has acquired their expertise and credibility through career, further education or industry specific training. A Consultant is paid to provide professional or expert advice with detailed guidance in a particular field. For example, you might be a Management or Business Consultant who is specialized in Executive Coaching and Development. In the scope of a client project, you are tasked with increasing a company’s efficiency and profitability. However you might then manage smaller projects to achieve the overall objective by facilitating communications training with top tier management and their individual teams. Dubai based Consultants figure highly in the fields of Marketing, Communications, Human Resources, IT, Media, Management, Business, Education, Training & Development, Lifestyle, Fashion and Project Management. A freelancer is also a consultant but works independently by selling their services by the hour, day, or job to multiple clients. Generally, a freelancer does not fulfill permanent or long-term contracts with one employer. Rather their services are enlisted for short-term projects or to achieve specific outcomes under the direction of the client. As a freelancer, your role is to take initial direction from the client and then complete the assignment in your own space and to predefined deadlines. Typically, the work is completed off-site, using your own tools and resources. Freelancing has long been the domain of journalists and designers. To conduct any form of business ‘legally’ in Dubai requires a UAE Trade License. Your Trade License clearly states the activities you are able to perform and where you may conduct your business (if within a Free Zone or Dubai LLC DED). The process of company setup can be complicated and time-consuming, especially if you are still in full time employment or new to the region. These two business structures are treated very differently and require professional guidance to determine which will be most appropriate for you. CREATIVE ZONE includes a team of company registration professionals who are passionate about bringing the dreams of aspiring entrepreneurs and SME’s to life. 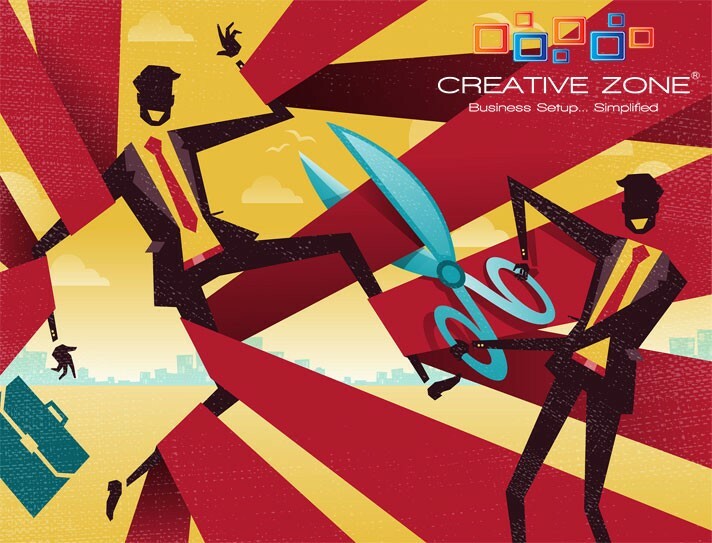 Established in 2010, CREATIVE ZONE is now the largest business set up advisory firm in Dubai, having successfully assisted with the launch of more than 3500 companies, a large portion comprising SME’s such as Consultants. Clients of CREATIVE ZONE enjoy dedicated account management and customer service well after receiving their company documentation. Cornerstone to the success of CREATIVE ZONE is a commitment to helping clients develop and grow their business. "In 2011, myself and my 2 partners decided to start a small consultancy. After some research we decided to set up in the Fujairah Free Zone with CREATIVE ZONE. All the processes required to be performed were easily achieved and we commenced operation without much ado. The one thing that we would never have been able to research or plan for when considering where to operate was the support provided by the CREATIVE ZONE Team.“ Garth Gaenssler of APB Consult (Project Consultancy). “The company set up was handled very professionally and clinically. Took off a lot of stress when we were new to Dubai. Good understanding and knowledge of the bureaucracy. There is a cost clearly to this service but I still wouldn't advise anyone tackling it directly unless they have a lot of spare time on their hands.” Muskan Thacker of New Discovery FZE (Business Consultancy). "I would like to put on record my appreciation of your prompt responses and seamless services rendered even during holidays and over weekends. I am truly happy with the quality of service provided by all the staff at CREATIVE ZONE." Balakrishnan Pramod of Red Sea Engineering Services FZE (Design & Marketing Services). If you are eager to start your entrepreneurial journey, refer to CREATIVE ZONE’S 5 steps to establishing yourself as a Consultant or Freelancer? Step 1. Do some research and choose your industry carefully. If all goes well this could be a highly profitable ‘forever job’! It is important to choose an activity that you will both enjoy and embrace with passion and pride. Remember, most people set up a business because they want to be their own boss, with financial freedom and flexibility. If you don’t enjoy what you do, then you may find it hard to motivate yourself later - and that lack of motivation can be an expensive mistake. It is important to know what market your new business will be operating in and how competitive that market is. Where can you improve on your potential competitor’s products and services, and how? Can you do it cheaper? Money is a huge motivator and business is often won or lost based on the cost. Entering into a new market blindly is as good as not entering it at all. You have to know where your clients will come from, and more importantly how you will keep them as clients. Think long-term if you want to succeed. Step 2. Create a business plan. While it is a requirement to provide a business plan as part of your trade license application process, it is also one of the most key planning tools for new company formation. A business plan is more than just a forecast on where you’ll be in a year, 3 years or 5 years. It also allows you to see things in black and white, and be able to compare your performance later against your predictions. Successful business owners will revise their business plan every year to factor in changes in costs, legislations and budgets. Remember the age old saying; “Fail to prepare, prepare to fail.” It is also worth remembering that most banks will insist on a business plan should you ever need to apply for certain facilities such as business loans, credit cards or card-reading machines. Step 3. Choose your company name. So you know your market and you know how you’re going to do business. Now you need to be creative and think about your branding. Your company name speaks volumes about who you are and what you do. A company name should be catchy but not trivial, memorable and relatively short. Some experts recommend not having more than 10 letters to the name. Don’t be tempted to use words like ‘Elite’ as it gives the impression that your services will be expensive, likewise words like ‘budget’ or ‘discount’ should be avoided for the opposite reasons. Step 4. Get a license. This is often the most daunting aspect of setting up your own business. It is not uncommon for people to delay setting up their company because they don’t want to tackle this problem. Thankfully help is at hand. CREATIVE ZONE is able to offer many different business set up solutions based entirely on your circumstances, requirements and budget. Whether you are a Consultancy or a General Trading company, there are packages to suit everyone. The best part about it is that once you’ve discussed what you want and what you need, you can sit back and let the experts do all the hard work for you. Step 5. Surround yourself with experts. No matter how much you know you can always learn more. It is always useful to be able to ask an expert when you come up against a tough question or decision. One of the biggest advantages of setting up a business in Dubai with CREATIVE ZONE is that we have a panel of experts in place who would be more than happy to help. Whether it is accounting or tax, immigration or labour laws you can find the help and advice you need to assist you in moving your business forward. Our business development and networking events will put you in touch not only with business owners who are happy to share their past experiences, but also professionals in a range of industries ready to provide ongoing support. Furthermore, you have the opportunity to grow your own referral network and client base. Establishing yourself as a consultant or freelancer has never been so easy. All you need is desire, determination and the 5 steps above.